It's that time of year again... and easily my favorite event of the year. Catalyst Conference--happening October 6-8, 2010 in Atlanta, where 13,000 young leaders will converge for the leadership experience of the year, including high-octane speakers, powerful worship, innovative programming, and an experience unlike any other. Hear from leadership authorities including Andy Stanley, Seth Godin, TD Jakes, Craig Groeschel, Francis Chan, Beth Moore, Perry Noble, and Christine Caine, along with several innovative thinkers and practitioners like best-selling author Daniel Pink, charity: water founder Scott Harrison, Gabe Lyons, First Response Team founder Tad Agoglia, and Rani Hong, winner of the United Nations Human Rights Award. Best Rates on Catalyst tickets end this Thursday, August 26th, so register now. 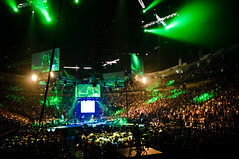 Call 888.334.6569 to speak to a Catalyst Concierge, or register online at www.catalystconference.com. Catalyst will sell out, so make sure and register early. Hope to see you there!